This simple potato dish makes an impressive passed appetizer. I like to add a little hot sauce to my potatoes but you can use nutmeg, a dash of red chillie powder, finely chopped green chillies, even curry powder! Steam potatoes until soft and fully cooked through. Cool, then peel. Mash potatoes. Then cream them using a potato ricer or a food mill. You can also use a Puran Patra but do not grind in a mixie. You want to get a very smooth, somewhat fluffy, grain free potato mash. Using a fork stir together potatoes, beaten yolks, butter, Tabasco, salt, and pepper in a bowl and smooth and well mixed. Taste for seasonings. Preheat oven to 350F. Line this tray with wax or parchment paper. Use a little bit of the potato mixture to stick the paper to the tray on 4 sides. Keep the brushing liquid of egg and cream ready. Transfer potatoes to a piping bag fitted with a 3⁄4" star tip. Squeeze and pipe twelve 16 individual stars about 1" high. 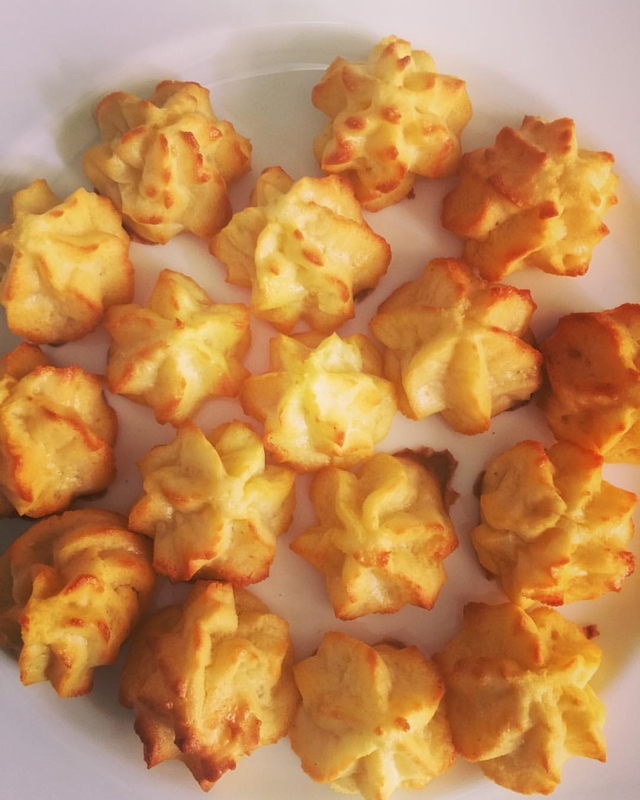 Using a pastry brush or in the absence of one brush each star with a little egg mixture-be carefully not to damage the shape. Don't press or push just lightly brush. Set tray in the middle of the oven. Bake until golden brown, 35–45 minutes. Remove from the oven and let sit no more than 5 minutes. Gently, using a very flat spatula remove each star and place on a serving tray. Serve immediately. To use the leftover egg whites try my chocolate macaroon recipe. This creamy and delicious pudding is a favorite during Gudi Padwa in the Konkan belt. Gudi Padwa is called Samvatsar Padvo by Konkani Hindus. Soak Tapioca seeds in water for 20 minutes. Drain. 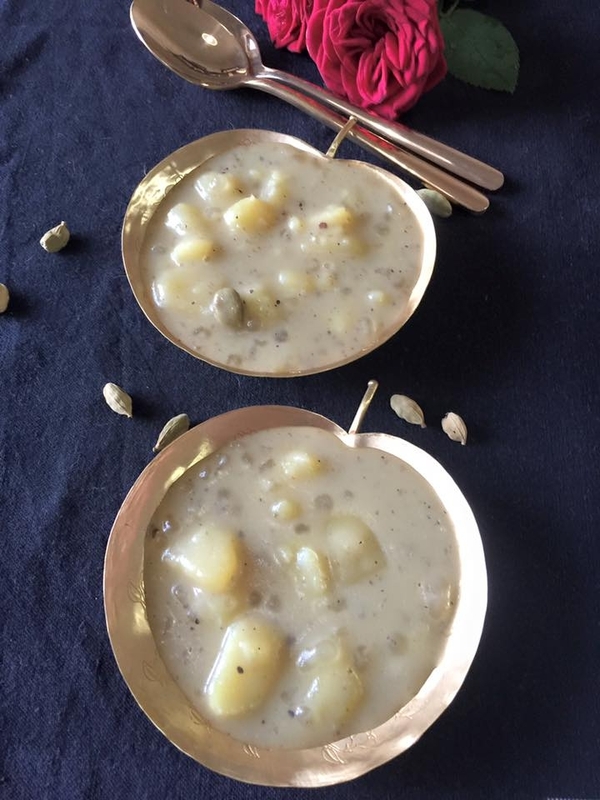 Combine tapioca, coconut milk, sweet potato, cardamom in a medium size saucepan or kadai. Add 2 cups water and cook on a medium flame about 20 minutes. Stir from time to time. Add jaggery and continue cooking until you have a very thick and creamy consistency. Add more jaggery if you want more sweeteness and water if you want a thinner consistency. Stir in cashews if you wish. This dessert can be served warm or cold.